Surf Accommodation Hossegor. Stay At The Secret Spot Lodge, Hossegor. Located near Hossegor South West France, the Secret Spot Lodge offers surf accommodation thats a cut above the rest. We have 4 bedrooms all with ensuite bathrooms. Enjoy the ‘home away from home’ feeling with all the comforts of home. 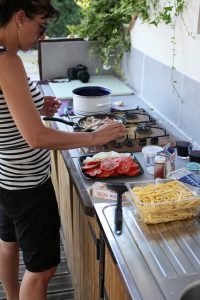 We have a swimming pool , sundecks, summer kitchen with BBQ’s , private off road parking, a legendary breakfast, and everything you need to relax and chill on your French surf trip. We are minutes from Messanges and Moliets beach which have some of the best hidden surf spots around. 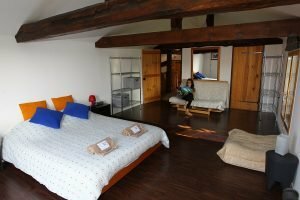 Our surf accommodation near Hossegor is a stone’s throw from shops, pubs and restaurants and many other various activities – most importantly the beaches. We are always around and always keen to surf , so when you stay with us you can easily jump on the dawn patrol mission that starts every day before sunrise. Your hosts, Troy (English) and Nelly (French), ensure that ,with their lifetime’s local knowledge of the area and the surf, that you are in good hands at The Secret Spot Lodge with your family or your friends. Our quality B&B caters for all, with a hassle-free atmosphere and are open all year round.